Pahrump Chamber of Commerce officials are urging local families to mark their calendars for the first weekend in March as they prepare for the inaugural Pahrump Balloon Festival. 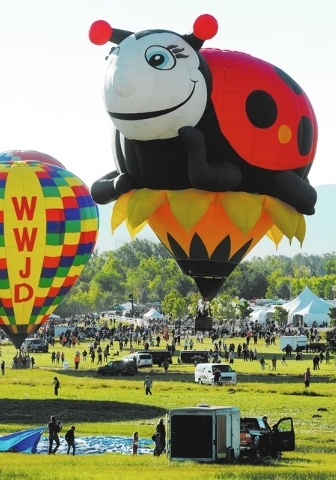 The three-day event will take place at Petrack Park on the morning of March 7, 8 and 9 where upwards of 20 balloonists from across the southwest are expected to participate. Chamber President Debbie Davis said Pahrump Town Board Vice Chair Bill Dolan proposed the event to town board members and staff early last year but funding issues prevented the town from officially sponsoring the festival. “The town approached the chamber of commerce to see if we would be interested in doing it. After looking at all of the costs, we just decided that we would like to put it together,” she said. “Right when it starts to get dark, we are hoping to have about four of the balloons in the front of the parking lot closest to the highway.” said Chamber CEO Michael Dreyer. “They will shut the lights down in that section of the lot and the Pahrump Nugget is going to provide music and I think we are going to try and synchronize the balloon glow with the music. We want to get the community excited. It’s our way of inviting families out to the event,” he said. The CEO also said the chamber is trying to gauge the community’s response to the first-time event. He noted that monies raised from the festival will go to a worthy local cause. “Being this is the inaugural event, we’re not really sure what we are going to get as far as foot traffic is concerned. It’s a brand new event for the community so dollar-wise, we are tight. In excess of what it costs, we want to take the majority of those funds and put them towards scholarships that the chamber is doing now. We created two scholarship funds but we haven’t yet set the parameters of what the scholarships are going to be, but they will be for young adults in the community,” he said. Davis, meanwhile, said attendees will also have the opportunity to take part in balloon rides during the event. “Aside from the ones that you have to pay for, we have four balloon rides that we are going to raffle off. We are going to sell tickets at $10 apiece and we’re going to get the help from the Nye County School District and any non-profit organizations that want to help. They, in turn, will get 20 percent of the proceeds from the sales of the raffle tickets that they sell. We will start passing the raffle tickets out at the beginning of February,” she said. Dreyer noted that a veteran balloon pilot, who has more than 40 years’ experience in hot air ballooning across the country, is playing a major role in Pahrump’s event. “Bill Glen has been involved in countless balloon festivals around the United States. He’s the one who sat down with the chamber board and planned it all out,” Dreyer said. Glen has flown in more than a dozen states as well as Canada and Mexico. The event in March will be the first time he has flown over the Pahrump Valley. “We have been thinking about having an event in Pahrump for some time. I know it’s Nevada’s Sesquicentennial Year. On our way back from a Reno balloon race recently, we stopped by Pahrump and visited with Mike from the chamber. We drove around Pahrump and visited with some residents and I think the interest level is there. It’s a big enough area with lots of potential landing sites,” Glen said. “We are totally at the mercy of the wind. Wind goes all different directions at different elevations and we use the winds to steer to destinations or steer clear of an area that we don’t want to be. We are governed by the Federal Aviation Administration and we are licensed. Our maneuverability is basically up and down,” he said. The balloonmeister also noted that “tethered” balloon rides will be available the weekend of the event. He cautioned that the weather will ultimately determine how well the event goes and whether it will literally get off the ground. “There will be one or two balloons, particularly on Saturday morning, that will offer the tethered balloon rides at Petrack Park’s baseball diamond. With the tethered balloon rides, it must be dead calm with winds less than three miles an hour. We fly early in the morning because it’s cooler and there’s less wind. We go up, hang out for a little bit, come down and put the next passengers on board and go back up. We want to be as safe as we possibly can,” he said. Additionally, Glen said the festival has the potential to make a huge economic impact for area businesses. “This will bring dollars into the community because the pilots will bring crew members with them. As far as money generated, they have to eat and buy gas as well as stay in rooms. They will all spend money in town so it really does generate funds for the local economy,” he said. 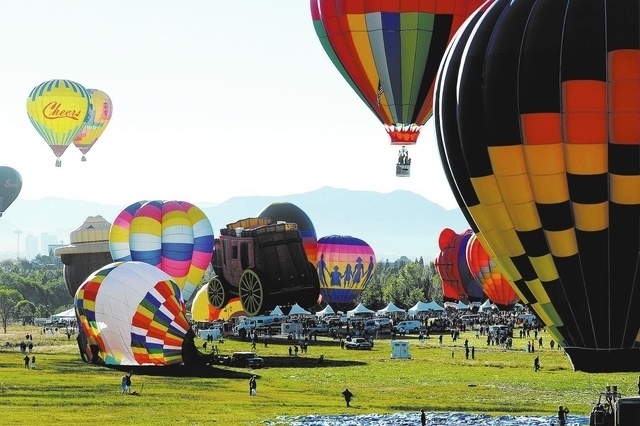 As an example, the Great Reno Balloon Race estimates an average attendance of 150,000 where it began with 20 balloons in 1982. The event was created to keep visitors in town between the Nevada State Fair and the Reno Air Races. The event has ballooned to include 100 entries. The 32nd annual event is scheduled this year for Sept. 5-7, in its traditional slot the weekend after Labor Day. 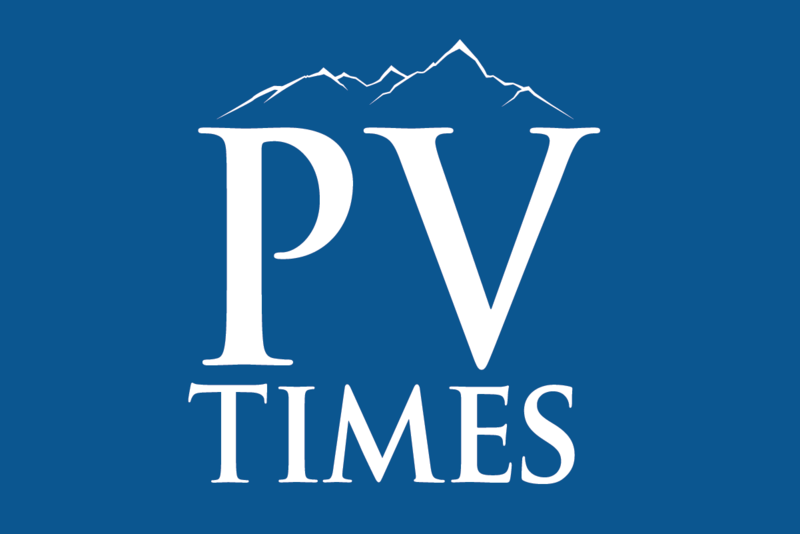 Dreyer, meanwhile, said Petrack Park has plenty of room to accommodate the Pahrump Balloon Festival which may become an annual event for the town. “We have all three fields and it will be set up similar to the “Liberty Festival.” We will have vendors along the tree line and maybe one or two balloons set up in the middle of the infield doing the tethered rides. We want to get the price down as low as we can to give everybody an opportunity to enjoy a balloon ride,” he said. Information on balloon sponsorships, entertainment and vendor opportunities can be obtained by contacting Elaine Trent at the chamber office at 727-5800. PVT Senior Writer Mark Waite contributed to this story.